Hello everyone, happy Tuesday to you all! Did you have a lovely weekend? I had a little lesson in checking party invitations yesterday. I had to take both girls to a birthday party yesterday and I really wasn't looking forward to it. As a general rule, I never take both of them to a party together, unless I have someone with me. So I was already a little anxious before setting out and this wasn't helped by it being in a small town about 20 minutes away that I barely know. We set off, heading to the town hall and what I thought was the venue, only to get there and find it was locked. On phoning D to check the party invite, it turned out I got the town right and location wrong! Didn't I feel an idiot walking back down the road to the car. We had an invitation to a party at the town hall a few weeks ago and for some reason I obviously had that stuck in my mind. We eventually found the correct venue and gave everyone a good laugh at us turning up at the wrong place! 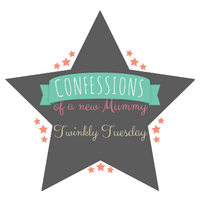 Anyway, enough rambling from me and on to this week's linky and Tuesday Twinkler! 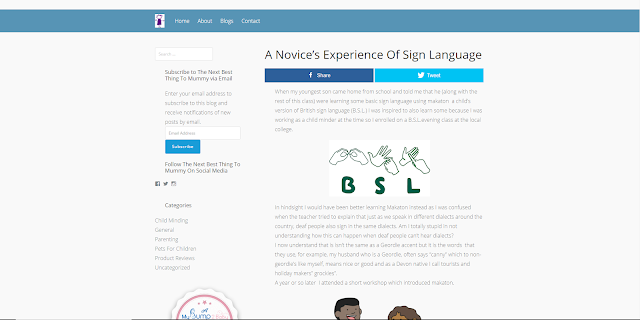 Karen at The Next Best Thing to Mummy has written about being inspired to learn sign language and her experiences with it as a child minder. Unfortunately my experience of sign language is limited to a few words from Something Special (Mr Tuuuuuuuuumbble). I can definitely remember how to sign Mr Tumble but the rest is a little hazy as it was guaranteed quiet and a hot coffee. I would love to learn a little in the future, how about you? So many details to keep in our heads, it's a wonder we ever land in the right spot for any event!